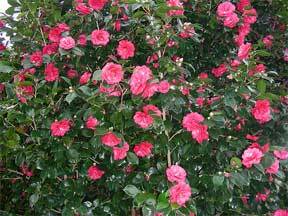 Prized for their beautiful flowers, camellias are also attractive shrubs. Their glossy foliage lends great distinction to any planting, and their irregular yet compact growth habit suggests them for massed planting as well as specimen use. Under favorable conditions they grow 6 feet or more in height. The paths shaded by ancient camellias at Middleton Plantation near Charleston, South Carolina, are a delight that no garden lover can ever forget. As with any plant material, camellias develop most attractively when they are happy in their surroundings. Cultural pointers to guide you in selecting a congenial location for your own camellia plants are here. Even as far north as New York (a marginal area for growing of camellias outdoors the year around) they have been used with great artistry and have attained considerable height. In a garden in Great Neck, Long Island, hybrids of both the Japonica and Sasanqua types grow 3 to 4 feet high and their glossy foliage is a startling contrast to the dull white trunks of birches that shelter them from the hot sun. Camellias are good indoor plants too. In a garden of my acquaintance at Bernardsville, New Jersey, tubbed plants spend long summers on a shaded terrace and their winters indoors beside a picture window which looks out in a westerly direction to a view.